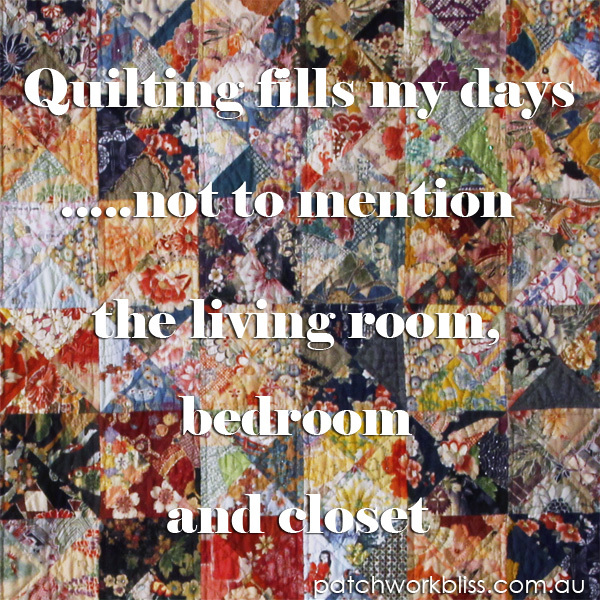 Becoming an extreme quilter is not for the faint-hearted. It takes dedication, passion and sacrifice for a life full of creativity and immeasurable pleasure. Thoughts of quilts invade their minds while they’re driving, sleeping, eating and showering. The extreme quilter will be in conversation with someone and not hear a word that’s said because they’re thinking of hexagons or fussy-cutting. Enthusiastically they’ll welcome any opportunity to make another quilt. Beds, laps, children, pets, charities, births, deaths and marriages are all worthy recipients. Extreme quilters know all the best quilt stores and always keep up to date. They follow Instagram so they’ll be the first to know when the new fabrics arrives. While many quilters only shop when they need to, the extreme quilter has no qualms visiting weekly, daily and even hourly. Extreme quilters buy a lot of fabric and this fabric needs to be stored. This brings us to the next point. In the beginning, extreme quilters purchased the exact fabric quantities the patterns suggested, but somewhere along the way, they started to buy a little extra — just in case. Now, they don’t need a reason, they buy it because they can. The extreme quilter’s sewing room is a veritable treasure trove, but keeping their stash contained in one place can be problematic. What begins as an orderly arrangement soon expands and their stash could be stored in tubs, closets, under beds and in the attic. I know of fabric being stored in a shower (obviously unused). True story. When the extreme quilter is on a deadline, meals can become slap-dash. If a recipe takes more than twenty minutes to put together, forget it. The microwave is their most used kitchen appliance. Ready-meals, canned soup and instant noodles are eaten on the run — not only for convenience, but mainly because their dining table is covered with the quilts in progress. Bit by bit the extreme quilter’s social life slips away. They can’t take their sewing to the movies so they stop going. Night’s out become a distant memory. The extended family get-togethers become phone calls. Phone calls become emails. Emails become texts. When an extreme quilter says they’d rather be quilting — they really mean it. Eventually, it’s just them and their quilts, but that’s OK because they’re as happy as can be. Be warned. There’s no taming the extreme quilter once released. Common wisdom says us all things in moderation but where’s the fun in that?